Paganoni Swamp Reserve is located on Paganoni Road, Karnup. It is bounded by Paganoni Road to the north, Kwinana Freeway to the east, Southern Metro Rail to the west and the city boundaries of Rockingham and Mandurah to the south. 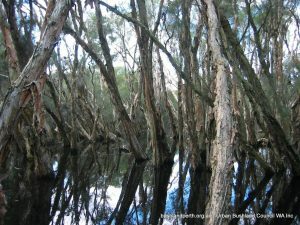 Paganoni Swamp Reserve is the most southern reserve of Rockingham Lakes Regional Park. This Conservation Category Wetland is the largest in the Stake Hill Wetlands chain. The central wetland is surrounded by Tuart and mixed Banksia/Sheoak woodlands. To the east Tuarts give way to Jarrah/Banksia woodlands on the older Bassendean sands, and along the western boundary heathlands occur on limestone ridges. Paganoni Swamp is a Bush Forever site. It is habitat for endangered Black Cockatoos. Friends of Paganoni Swamp was formed in 2004 primarily to combat the spread of Geraldton Carnation Weed (Euphorbia terracina) on the reserve’s western boundary. Since then we have expanded our activities to include bird walks, fungi forays and assisting scientists from government and universities to increase our knowledge about this unique and precious reserve.